On 27th of June, the France Post issued two stamps of the denomination of 0.58€ each as above. 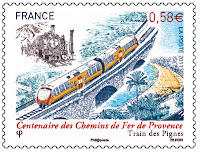 The stamp on the left above is dedicated to the still functioning steam train of Pignes which celebrates its 100th year of opening and continous operation since 1911. 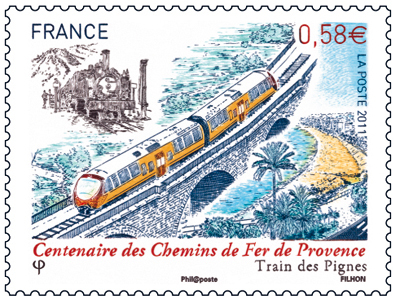 “Chemins de fer de provence” is an old famous railway company of the Southern France that runs a a unique route between Nice and Digne-les-bains. The train is locally referred to as the “train des pignes” (the pine nuts train). It may be added here for the information that the Railways of Provence, formerly "Railways of the South of France", is made up of three rail networks. One of them, the network of the Alps, was one of the lines between Nice and Digne-les-Bains and was completed in 1911. Now it is the only remained in operation in this region and carries more than 400,000 passengers per year. Its role is twofold: Nice suburban service and tourist transportation in the hinterland by the steam train of Pignes. The line will soon have a new modern railcar. 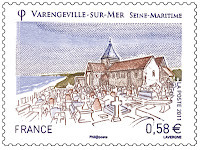 The stamp on the right is dedicated to its historical heritage - the town of Varengeville-sur-Mer. 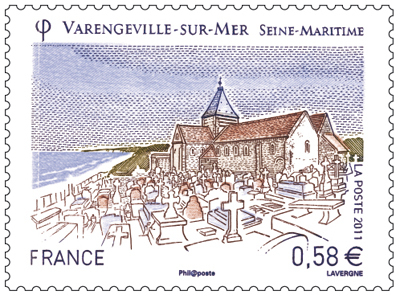 Varengeville-sur-Mer is located on the Alabaster Coast, near Dieppe. Its church - the Church of St. Valery - originally built in the twelfth century and rebuilt in the sixteenth century, is famous for the architectural qualities, its marine cemetery and its exceptional location, overlooking the sea from cliffs of the Ailly. Both stamps are priced 0.58€. But what makes them extra ordinary is that their face value was to live for only four days as on 1st of July 2011, France Post revised its postal rates from 0.58€ to 0.60€ for a standard letter (below 20g). Thus the two stamps issued just four days ago become useless as now an additional 0.02 € will have to be added when using these stamps.